I've had a blast exchanging gifts with other petite ladies last year. Of course, I wasn’t hesitant in joining them again this year. Thanks, Jessy for organizing the gift exchange! Without further ado, my secret Santa was..... Lorraine of Petite In The City. 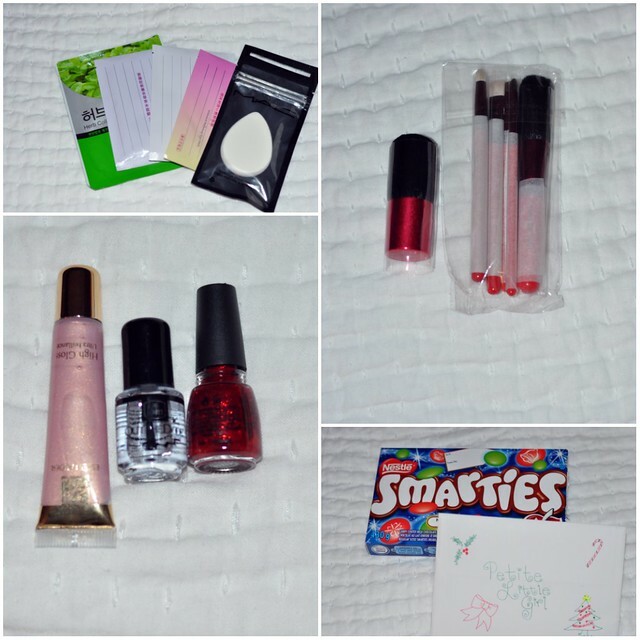 I was so excited to learn that my secret Santa wasn’t someone in the U.S. She got me a few things from my wishlist as well as some other goodies. The sweetest Lorraine also got my little girl a huge box of Smarties. Her eyes lit up like Christmas lights when she saw it. Thank you for taking extra time and finding the perfect gifts for both of us. My draw was Vicky of Vicky’s Daily Fashion! I was thrilled to have Vicky as my draw. She is one of the blogger friends that I actually have met in person. She took good care of me when I was in Boston. Don’t forget to check out her blog to see what I got her! I also received a couple of gifts from my fellow bloggers. One of the items on my wishlist was a pair of pearl earrings. Next thing I know, Jean of Extra Petite sent me a set of grey pearl necklace, matching earrings and a pair of falsies. I adore them so much. I own 2 pearl necklaces and they were both white. I am elated to add this grey one to my jewelry box. Last but not least, I received a package from Elle of Fast Food and Fast Fashion yesterday. 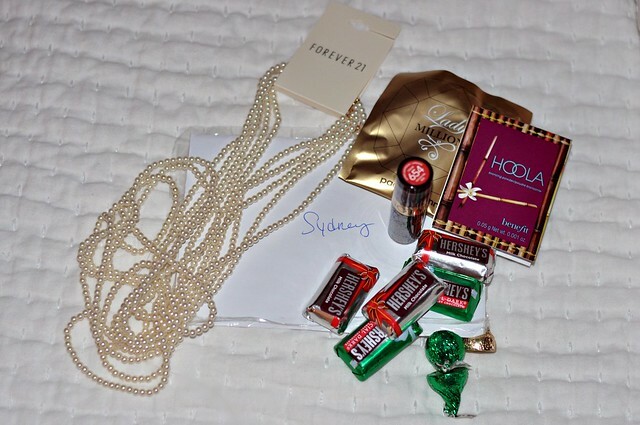 She sent me another pearl necklace along with some other sweet treats. The petite blogger community is one of the reasons that I enjoy blogging so much. I have met a few bloggers and they’re just as sweet in person as they’re online. Thank you, everyone, for your thoughtful gifts. I hope you enjoy this post and Happy New Year to all! Is is true that Smarties in the US are different than the ones us Canadians have? I completely agree, love how supportive petite bloggers are :) I have always felt welcome and included since the beginning! Yay for more face masks! :D So sweet of all the ladies to send you these goodies. Now you have pearls galore! P.S. Same question as Elaine above. I never heard of this Smarties thing?! @Elaine A (TOBeautyReviews), @The Little Dust Princess To be honest with you, this was the first time I tried Smarties. They look like M&Ms but taste different. I have never seen Smarties in the U.S. I might have a look around the next time I'm in a grocery store. Sydney these are all great gifts! I hope you enjoy all of them and also I have a funny story about smarties. When I was about your daughter's age there was a kid who brought smarties in for his birthday. My friend told me that if we ate smarties they would make us smart so....I didn't study for a spelling test. And haha....I didn't do too well and had to explain to my mom why I did bad...because if you eat smarties they make u smart so u don't have to study.. Yeah....uh huh! lol! The card she made is so cute! Makeup accessories are always so nice!! The pearls and the leopard look great together, Sydney! Aww, so sweet that Lor included a gift for your little one! Great gifts all around! oooh hoolah? i've always wanted to try this, but haven't splurged bc i dont like the packaging, but I heard it's one of the best and very few no-shimmer bronzers. great gift! love all the pearl necklaces! it looks great with your leopard print sweater. Wow - so many great gifts. Loving all the pearls too. What a great community. You look awesome in that ON leopard top, I tried looking for it in my local ON but they were all out. I have never tried Smarties! :D Love all the gifts, I think it's a greatest feeling when you see a box from the mailman even if it's something small. Hope you have a great New Yr Sydney!!! I also love the thoughtful gifts you picked out for Vicky. Her happiness with them is evident by the big smile on her face in the reveal and also the teaser post, lol! Lastly thank you so much for your friendship over this year and I am so happy to have met you in person. I only hope we can meet again, not under the circumstances of a hurricane! Have you tried ketchup chips? They don't have them in US either! Its so sweet of the other girls to send you stuff too! I love those grey pearls!! They're just as versatile as pearl (white) coloured ones!